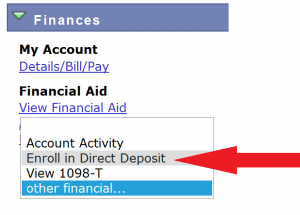 Under the Finances section click on the dropdown menu and select Enroll in Direct Deposit. 4. On the Account Services/My Direct Deposits page click on the green Enroll in Direct Deposit button. 5. On the Manage My Bank Accounts/Add Bank Account Details page fill out the required information for your bank account then click the Next button. Do NOT enter debit card number. Enter the complete bank routing number and account number. 6. On the Manage My Bank Accounts/ Agreement page Review the agreement page and click the checkbox next to “Yes I agree to the terms and conditions of this agreement.” Then click the Submit button. 7. 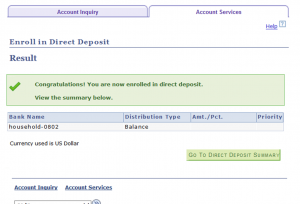 On the Result page review your information then click the Proceed to Enroll In Direct Deposit button. 8. Review the My Direct Deposits/ Bank Account Summary page and click the Proceed to Enroll In Direct Deposit button. 9. On the Enroll in Direct Deposit/Add Direct Deposit page select your account from the dropdown menu then click the Nextbutton. 10. Review your account information and the agreement on the Enroll in Direct Deposit/ Agreement page and click the checkbox next to “Yes I agree to the terms and conditions of this agreement.” Then click the Submit button. 11. Click the Go To Direct Deposit Summary button and verify that the correct account has been selected. 12. If you need to change or correct the account for your direct deposit, see Modifying Your Direct Deposit. 13. If you decide to cancel direct deposit you will need to contact the Business Office by phone at (207) 768-9545. If you do not see the following screen at the end of this process you have NOT completed the required steps for enrollment in direct deposit. 5. On the My Direct Deposits/Bank Account Summary page, click the Proceed to Enroll in Direct Deposit button. 6. On the Enroll in Direct Deposit/Add Direct Deposit page select your account from the dropdown menu then click the Nextbutton. 7. Review your account information and the agreement on the Enroll in Direct Deposit/ Agreement page and click the checkbox next to “Yes I agree to the terms and conditions of this agreement.” Then click the Submit button. 8. Click the Go To Direct Deposit Summary button and verify that the correct account has been selected. If you need to change or correct the account for your direct deposit, you will need to add a new account to take the place of the existing one. 4. On the My Direct Deposits/ Direct Deposit Summary page, click the Modify Direct Deposit button. 5. On the My Direct Deposits/ Bank Account Summary page, click the Add Another Bank Account button. 6. On the Manage My Bank Accounts/Add Bank Account Details page, fill out the required information for your bank account then click the Next button. Do NOT enter debit card number. Enter the complete bank routing number and account number. 7. On the Manage My Bank Accounts/ Agreement page Review the agreement page and click the checkbox next to “Yes I agree to the terms and conditions of this agreement.” Then click the Submit button. 8. On the Result page review your information then click the Proceed to Modify Direct Deposit button. 9. Review the My Direct Deposits/ Bank Account Summary page and click the Proceed to Modify Direct Deposit button. 10. On the Enroll in Direct Deposit/Modify Direct Deposit page select the new account from the dropdown menu then click theNext button. 11. Review your account information and the agreement on the Enroll in Direct Deposit/ Agreement page and click thecheckbox next to “Yes I agree to the terms and conditions of this agreement.” Then click the Submit button. 12. Click the Go To Direct Deposit Summary button and verify that the correct account has been selected. If you decide to cancel direct deposit you will need to contact the Business Office by phone at (207) 768-9545.